When it comes to my skin, my primary concern is dealing with my (hormonal) acne. Note to self: make an appointment with a dermatologist asap! However, aside from wishing I had clear skin, I also always hope and strive for a complexion that’s both bright and glowing. Think about it. You’d always look so refreshed and you can virtually ditch all your highlighters and whatnot! Plus, there’s less of a need to layer on the concealer and foundation just to get your skin tone as even as possible. 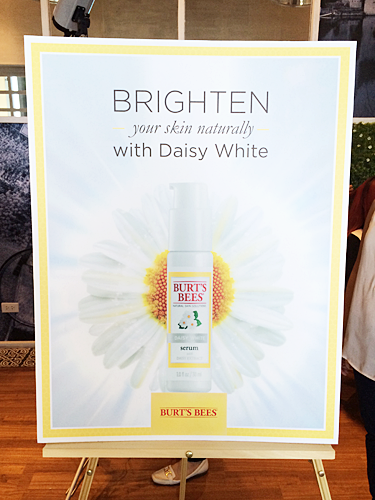 So when I got an e-mail almost a couple of weeks back about an event for the formal launch of Burt’s Bees newest skin care line, Daisy White, you could say I was…buzzing with excitement! 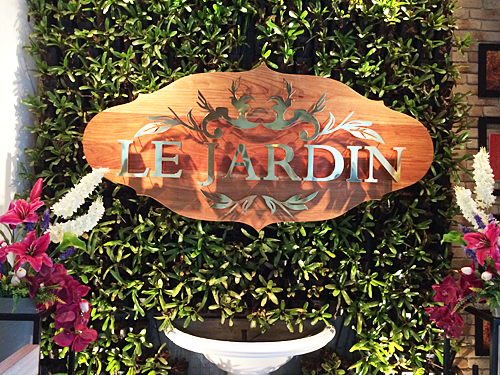 The event was held at Le Jardin at The Fort. 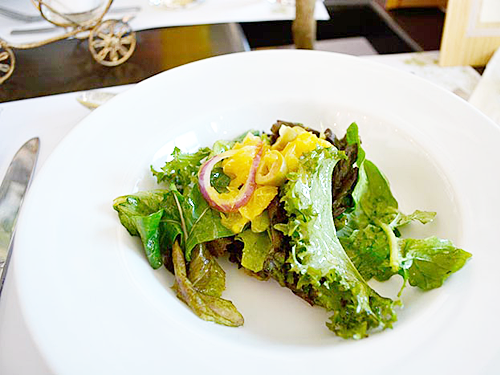 I had never gotten the chance to try this resto before, but I did read up on some good reviews about it. It’s very conveniently located near my house too, as is The Fort itself, and I arrived there within twenty minutes! I was actually half an hour early. I’m usually an early bird when it comes to events, haha. 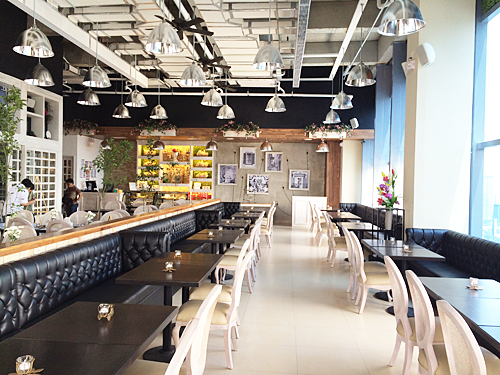 I like the interior of Le Jardin. It’s very classy and quite upscale, yet still has a relaxing and casual atmosphere so it’s perfect for either a date night with your significant other or a place to dine with friends or co-workers. Plus, look at all the lovely natural light that streams in thanks to the numerous, large windows! When I think of daisies, the words “fresh” and “light” instantly come to mind and that’s essentially what the new Daisy White collection is all about. The collection is comprised of four products, plus the newest addition to the Daisy White family which is the serum! Don’t worry, I’ll be giving a quick breakdown of all the products in the collection in a little bit! 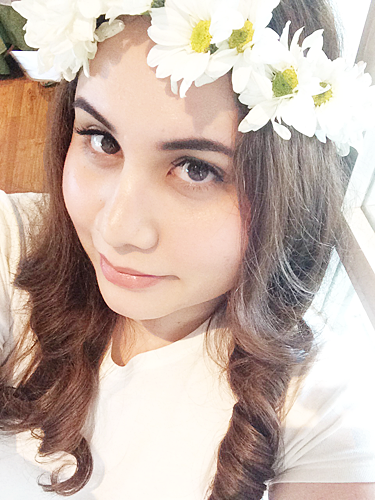 As part of a cute activity, we were told we could make our own flower crowns using, of course, daisies! I never made a flower crown before so it was quite a challenge, especially since I’m not very good at arts and crafts-type activities. Eventually I just settled on borrowing a pre-made crown because I wanted to take pictures with one on already! Haha. Me wearing one of the crowns. We could also get our hair styled during the event so I asked for soft, doll-like curls. Hmm. I don’t know why one of my eyes looks blue-ish purple in the picture! 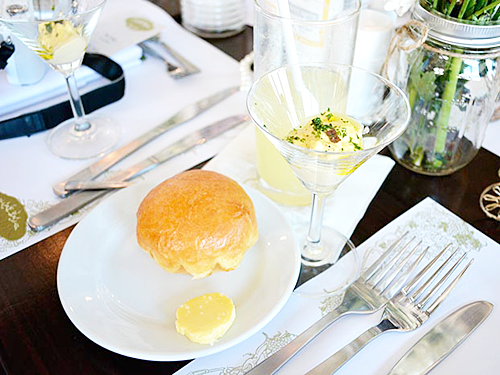 After most of us tried our hand in making the crowns, we sat down to a sumptuous lunch of scrambled eggs with truffles for our appetizer, a chilled salad with orange segments and olives, organic chicken breast stuffed with pork rillettes and mustard sauce, and assorted macaroons for dessert! Everything was delicious and I’m definitely coming back for the chicken and macaroons! 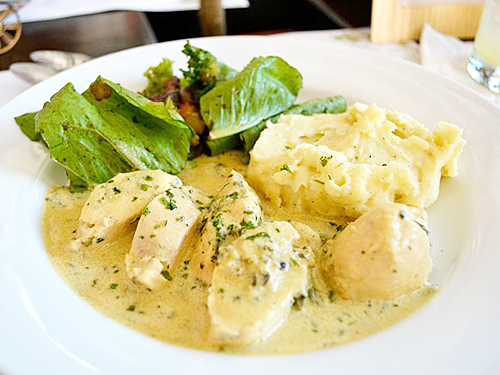 By the way, thank you to Genzel from GenzelKisses.com for the food pictures! I lost the ones I took and she was sweet enough to let me use hers. 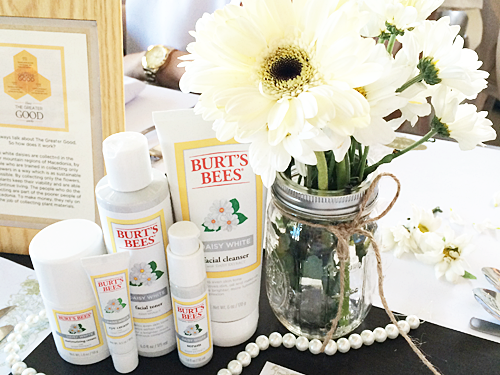 Did you know that Burt’s Bees works for the greater good when it comes to harvesting the daisies they need? The daisies are collected in a sustainable manner in the high, mountain regions of Macedonia by trained members of the poorer population. Since they’re collecting the plant material needed, they’re able to earn money and make a living! How nice is that? Summer Snowflake: brightens the skin and smoothens it out by minimizing the appearance of fine lines and wrinkles. Tonka Bean Bioferment: helps to increase skin’s luminosity. Pearl Powder: used as an anti-inflammatory and to improve the overall appearance of skin. Indian Gooseberry: promotes your natural skin tone and aids in reducing the appearance of hyper-pigmentation. Alpine Plant Complex2: for brightening and for evening out skin tone. Multi-Fruit Complex3: moisturizes and reduces surface dullness by increasing the rate of cell renewal for smoother looking skin. With a list like that I can already feel my skin becoming brighter just reading it! I wasn’t the biggest fan of ‘organic’ or ‘natural’ beauty products before, simply because I felt they weren’t effective enough for my different skin care needs. But when I tried one of the Burt’s Bees lip balms a couple of years back, I quickly changed my mind and became more open to them. When Burt’s Bees says natural, they mean it too. As brand manager May Samson said, "We don’t, or try not to, use ingredients we can’t spell." 1. Daisy White Serum (PHP1,650.00/30g) – Infused with the white beauty of Daisy Flower Extract, the serum is clinically proven to visibly brighten skin and help diminish the appearance of pigmentation or discoloration to even skin tone. The result? A brighter, more luminous face, naturally. 2. Daisy White Moisturizing Cream (PHP1,650.00/50g) – Formulated with Daisy Extract, this lightweight face cream moisturizes and visibly evens skin tone while improves surface dullness and overall appearance of skin. 3. Daisy White Facial Toner (PHP795.00/175ml) – Infused with Daisy Extract, this facial toner is clinically proven to help improve the appearance of surface dullness by gently exfoliating skin. It removes lingering traces of dirt, oil and make-up to help reveal a more even skin tone and softer skin. 4. Daisy White Facial Cleanser (PHP 795.00/170g) – This cream cleanser is clinically proven to help improve the appearance of surface dullness by gently exfoliating skin while cleansing away dirt, oil and makeup without over-drying. The result is skin that looks brighter and luminous. 5. Daisy White Eye Cream (PHP1,650.00/10g) – Dark circles and puffy eyes? Experience the best eye cream for your delicate skin. Their natural eye cream reduces the appearance of under-eye puffiness and is clinically-proven to visibly diminish the appearance of age spots around the eye area. 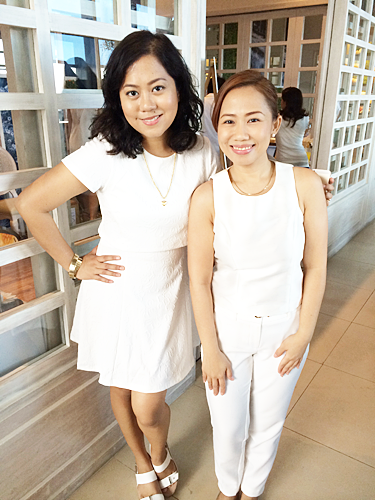 A shout out to Liz and May, both looking wonderful in white and as fresh as daisies, for inviting me to such a fun event! Also to miss Maristes, the general manager. We all left with a generous and cute bag, or should I say briefcase, of Daisy White goodies to try out along with a couple of extra treats. So far I’ve been using the facial cleanser, toner, and moisturizing cream regularly and I can’t wait to do a proper review on everything soon! For more info and updates, do check out Burt’s Bees Philippines on Facebook (https://www.facebook.com/BurtsBeesPH), Twitter (@BurtsBeesPH), and Instagram (@BurtsBeesPH). 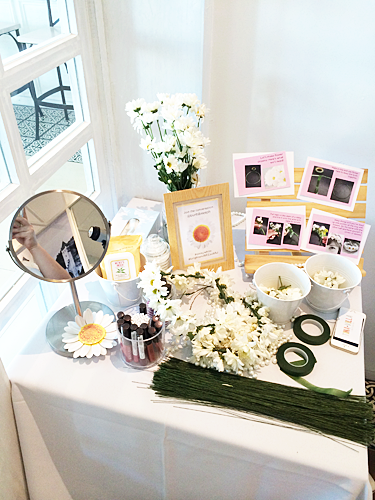 Have you tried out any of the Daisy White products yourself already? 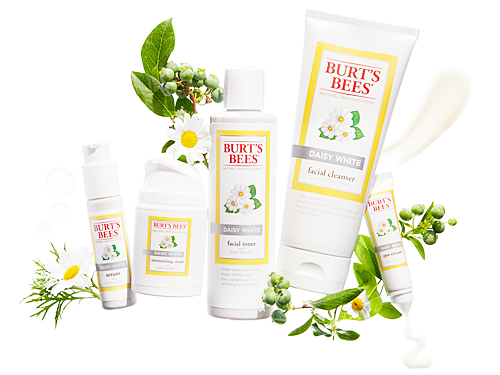 Do you have a favorite Burt’s Bees item? I’d love to know in the comments so share away!